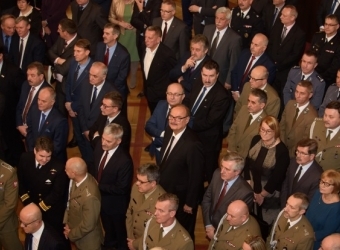 As an annual tradition Piotr Całbecki, Marshall of Kuyavian-Pomeranian Voivodeship invited representatives of local and state authorities, church, public services, business and non-governmental institutions to the Christmas Meeting. Cereal Partners Poland Torun-Pacific, producer of Nestlé breakfast cereal is closing yet another year with very good financial results. The company’s income is expected to be over 8% higher than in 2015. Both domestic and export sales are increasing. The company has also improved its share in the market of breakfast cereal in Poland. During this year’s summary, the above data was included in Wojciech B.Sobieszak’s, CEO of CPP Torun-Pacific, speech to gathered employees. The meeting was also an opportunity to announce the results of the Employee of the Year competition. The best ten received specially created statues, handed in by an honorary guest in the person of professor Andrzej Tretyn, the rector of the Nicolaus Copernicus University of Torun. There was 15th edition of the Charity Concert organized by the University of Nicolas Copernicus held on Saturday ina the university’s assembly hall. The money collected during the event, including the art auction, were donated for the treatment of Marta Szwonder – the university’s graduate. Excellent CPW sales results in Central Europe. 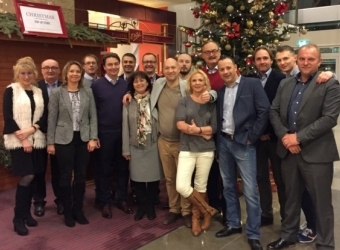 The team leading CPW Central Europe Cluster have summarized 2016 in high spirits. The expected income is going to be about a quarter higher compared to last year. The group of Social Insurance Company “scholars” originating from Cereal Partners Poland extended by ten new members! They received words of gratitude for many years of cooperation from the company’s President, Wojciech B. Sobieszak. They also received a Swiss watch – how appropriate a gift for the company whose shareholder is Swiss Nestle. 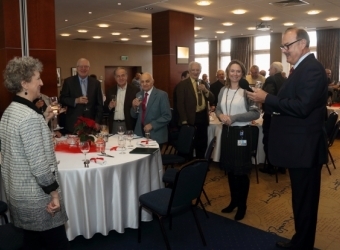 The celebration held in Mercure hotel was also the occasion to wish the company’s former employees all the best for Christmas. The most prestigious and most often quoted Polish press magazine “Rzeczpospolita” has specified the list of the best Polish companies. 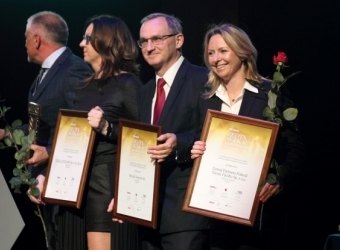 Cereal Partners Poland Torun-Pacific was among the 35 companies recognized with the diploma. Excellent results of the export sales have made the company recognized with the title of Export Brand of “Rzeczpospolita”. 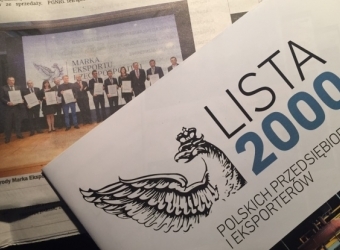 “The List of 2000” gala – which is a ranking of the best Polish companies was held on Wednesday, 23rd November in the Warsaw Stock Exchange headquarters. The award for Wojciech B. Sobieszak was received on his behalf by Hubert Kowalczyk, who is a CPP Regional Sales Director. The President of the City of Toruń, Michał Zaleski, has recognized the companies that significantly support sports people of Toruń. Cereal Partners Poland Toruń-Pacific has been the main partner of PACIFIC Cycling Club of Toruń since 1994 and has been recognized with the “Sport Patron of Toruń” title. Aleksander Wasilewski, VP of the company received the award on behalf of Wojciech B. Sobieszak, the President of CPP. Wojciech B. Sobieszak, the only one to hold the position of the President of Cereal Partners Poland Torun-Pacific. He has managed the company since it was founded. He celebrated 40 years of his professional career among the family, friends and colleagues . Having finished studies he started working in a food industry where he remained working up till now. One of the first projects he was involved in was a transformation of Torun starch factory into Torun cereal manufactory. Wojciech B. Sobieszak received congratulations from Piotr Całbecki – Marshall of the Voivodeship, Michał Zaleski – President of Toruń (in the photo) and many more. In a lovely sunny weather and gusts of wind, crowds of fans watched the second edition of Nestle FITNESS Tour de Toruń, 6th stage of Poland Road Race Championships for women. The route led 25 rounds on the curvy, often paved streets of Toruń city centre. Nestle FITNESS Cycling Team members were among cyclists taking part in the race. 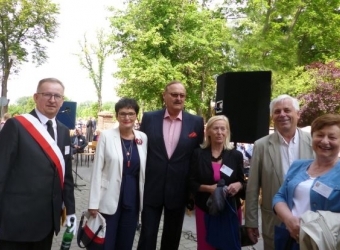 Almost half a thousand participants gathered for the 240th anniversary of one of the oldest secondary schools in Poland, Junior High School and High School in Trzemeszno. Among them present was Wojciech B. Sobieszak, who graduated from Trzemeszno High School 45 years ago. Copernican Library in Toruń received an unique book dated 1470. The item was presented to a library in Toruń by Cereal Partners Poland and the Marshall of Kuyavian-Pomeranian Province. Volunteer fire departments perform many important functions in the local community. First of all, they are responsible for saving lives and possessions of residents affected by natural disasters, fires or accidents. Firefighters also integrate local communities and spread knowledge of fire protection, road accidents prevention and first aid. 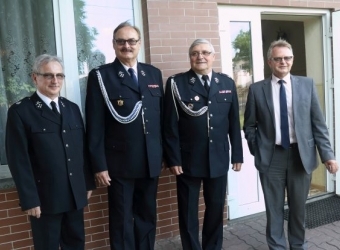 It is for their activities for the local community of Gmina Lubicz and Torun Powiat that Lubicz’ firefighters received a medal from Powiat Lubicz Council. The medal was handed to Ryszard Korpalski, the president of Lubicz VFD, by Andrzej Siemianowski. 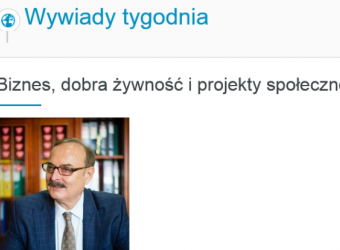 (Translation soon) Za nami trzecia edycja YES 4 YETI – cyklu warsztatów i praktyk dla studentów toruńskich uczelni z kierunków ekonomicznych. To odpowiedź firmy Cereal Partners Poland Toruń-Pacific (CPP), produkującej płatki śniadaniowe Nestlé i będącej częścią międzynarodowej grupy Cereal Partner Worldwide, na społeczny problem dotykający młodych ludzi, którzy po skończeniu studiów mają kłopoty ze znalezieniem zatrudnienia. For the 20th time in history “Gazeta Pomorska” announced the list of the most successful companies in the Kuyavian and Pomeranian regions. Cereal Partners Poland Toruń-Pacific and its President Wojciech B. Sobieszak have won 3rd place among large companies category for financial results achieved in 2015. The company has also been awarded with a special medal commemorating the 20th anniversary of “Złota Setka Pomorza i Kujaw” (“Golden Hundred of Kuyavian-Pomeranian Region”). Twenty companies, that used to be ranked top places received the anniversary medals. Małgorzata Szalewska-Urbańska collected the award on behalf of President W. Sobieszak. 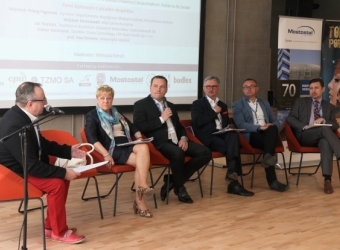 Lukasz Kaczmarek, CPP Controlling Department Manager, was one of the panelists of a debate that was part of an academic conference “Investment and real estate in the global economy”, organized by the Nicolaus Copernicus University. The conference was prepared by the University’s Department of Investment and Real Estate of the Economic Sciences and Management Faculty, which is celebrating the 40th anniversary of its inauguration. At the discussion, Cereal Partners Poland Torun-Pacific was brought up as an example of foreign investment in Poland, that involved not only transfer of capital but also diffusion of knowledge and other soft resources of the organization. 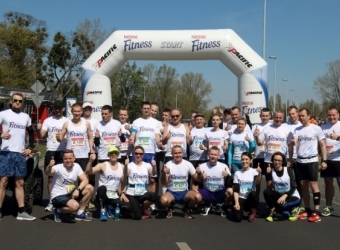 On Saturday, April 30th, the streets of Torun were a race track for about 3000 runners who took part in a Run Torun initiative. Among the participants were almost 40 CPP employees. The Nestle Fitness Stars Team, as they were branded, got the cake for the mots numerous representation of a single company. One of our teammates, Robert Wojnar, proved to be the best in the M40 category covering the 10 km distance in just 34 minutes and 26 seconds! Not only, do we make breakfast better but we make lives better as well! „Fitness cyclists” did not forget to celebrate Wojciech’s Name’s Day. They “seized” him in the Cereal Partners Poland office. The president’s Name’s Day coincided with a Birthday of Agnieszka Skalniak who is the leader of Nestle Fitness Cycling Team. On World Theatre Day, Torun drama community granted the Wilams, awards for creators, friends and promoters of theatre. The Audience Award went to Grzegorz Wisniewski, actor cooperating with Wilam Horzyca Theatre from 1991. The award included a trip abroad, which was funded by Cereal Partners Poland. 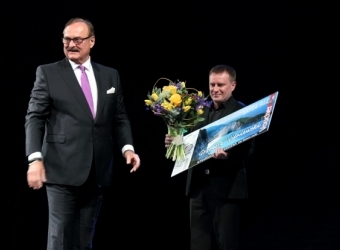 The company’s CEO, Wojciech B.Sobieszak, handed the award personally during the official gala. Professor Jerzy Tomala, honorary Chairman of the Supervisory Board of Cereal Partners Poland Torun-Pacific, is celebrating his 90th birthday. On this occasion CPP management team congratulated professor and thanked him for many years of wonderful cooperation. Professor Tomala is one of the founding fathers of Torun-Pacific. It is thanks to him and his relations that the Polish company established cooperation with foreign investors and became one of the biggest manufacturers of breakfast cereal in Europe. Until 2002 he served as the Chairman of the Supervisory Board of Torun-Pacific. Torun PACIFIC Cycling Club (TKK PCIFIC) and Nestle Fitness Cycling Team are changing their headquarters. The cyclists feel the most at home on the road, but a training and technical centre is a must-have for every sports team. From March 31st 2016 the club’s office will be in the Torun MotoArena, one of the biggest motorcycle speedway stadiums in Europe. 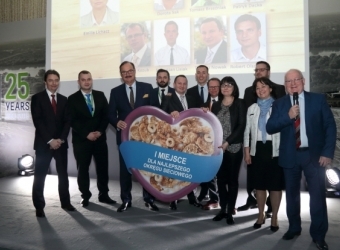 Magdi Batato, Nestle VP Operations, was a guest of all Cereal Partners Poland locations: cereal factory in Toruń, musli and cereal bars factory In Lubicz and Distribution Centre in Grebocin. He got to know the locations and, what is more important, the team. Nestle, world’s biggest food company is, together with General Mills, a partner and a shareholder of Cereal Partners Poland - Nestle breakfast cereal manufacturer. Wojciech B. Sobieszak, the President of Cereal Partners Poland Torun-Pacific, in a vast interview for www.kujawsko-pomorskie.pl website, talks about where the company’s success came from, about the team, social responsibility and how local companies influence the image of Kuyavia and Pomerania Region. On Friday night, Agnieszka Skalniak, third cyclist in the world and the best cyclist in junior women individual time trial, was awarded by the biggest Torun newspaper. 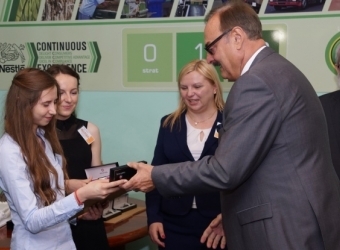 “Nowosci” awarded Agnieszka with a Silver Carriage (polish Srebrna Kareta, given to outstanding people of Torun public life) for her outstanding sport achievements in 2015. This was an amazing weekend for Agnieszka, as the very next day, during Athlete’s Gala 2016, she was recognised in a plebiscite for Torun Most Popular Athlete of 2015. Among those congratulating her was Wojciech B. Sobieszak, CEO of Cereal Partners Poland Torun-Pacific since 1994 main partner of Torun Cycling Club - Nestle Fitness Cycling Team). The works of Pablo Picasso and Salvador Dali, Lech Walesa’s book with his autograph, coffee cups once belonging to Beata Szydło, cowboy shoes from Texas and many more precious things were auctioned during the sixth Marshall’s Charity Ball, that was held on 30th January. “Le Gout du Bonheur No. 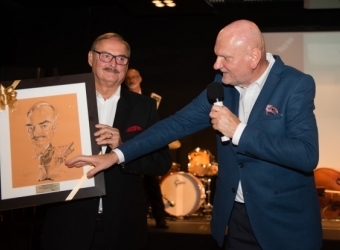 2” graphics by Pablo Picasso was bought by Wojciech B. Sobieszak, President of Cereal Partners Poland, who, accompanied by his wife, was one of the participants of the charity gala. All the funds gathered during the ball attended by 200 couples, will go to Special Educational Center in Grudziądz and Social Security Home in Kamień Krajeński. 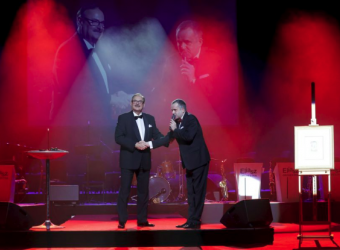 Business Centre Club awarded the best Polish companies during Saturday’s Great Gala of Polish Business held at the National Theatre- National Opera in Warsaw. Among the awarded companies was the manufacturer of Nestle breakfast cereal - the company of Cereal Partners Poland Toruń-Pacific, which again managed to win its 14th Diamond to the Gold Statuette of Leader of Polish Business. On behalf of Mr. Wojciech B. Sobieszak, the CEO of the company, the award was presented to Mr. Jakub Bąkalski, Finance Director of the company. Annual Operational Meeting of CPP Torun-Pacific commercial division traditionally was the opportunity to sum up the year, award the most successful sales representatives and present the plans for the following year. Last week in Warsaw there was the occasion for the commercial employees to meet again, but also to get together with those they work with most often.